CRJA-IBI Group was recently engaged for the design and construction of a new quadrangle and adjacent green spaces associated with a new Science & Engineering building at the University of Rochester. CRJA-IBI Group was selected from a 3-firm design competition to envision a new 4.5 acre open space associated with the new Wegmans Hall building. A majority of the original competition ideas have been incorporated into the final design. 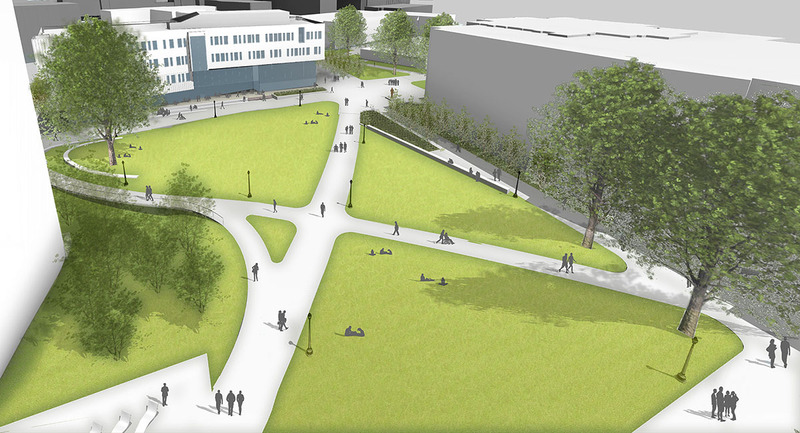 The new quad will create a vibrant, universally accessible green space for the community. The new spaces will accommodate formal student activities such as Meliora Day, Dandelion Day, Earth Day and commencement exercises and informal activities and learning. Areas for passive and active relaxation and interaction are a primary focus of the final design, providing spaces for these interactions that don’t currently exist. The site design brings clarity to the circulation paths to and through the quadrangle as well as to and from Wegmans Hall and the existing building. A new terracing ‘front porch’ has been incorporated at the south facing façade of Wegmans Hall allowing students to gather and overlook the quadrangle. The existing rain garden will be relocated to create a central green space and several beloved mature trees will remain as part of the campus. New plantings serve to enhance the campus arboretum, provide shade and mitigate seasonal winds.